The use of digital radiography allows us to effectively assess the skeletal system. At Northern Lakes Equine Practice, each of our doctors travels with one of the most advanced digital radiography units available. 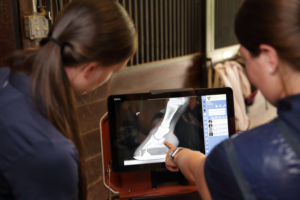 Our digital radiography units allow us to image a variety of regions including dental/skull radiographs, cervical/thoracic radiographs, and most portions of the equine limb. Whether being utilized for screening during a pre-purchase examination, or as a diagnostic tool to evaluate a specific problem, our digital radiographs can be analyzed on site. Should a referral be needed, our veterinarians have the ability to email the radiographs stall-side to the desired specialist. We also work closely with board certified equine radiologists for advanced assessments in complicated cases. Digital Radiographs can also be used to help your farrier better trim and/or shoe your horses. Sine 90% of lameness comes from the foot, having appropriate hoof angle and heel support can decrease the risk of stress related injuries in the performance horse. The only way to truly asses whether your horse is appropriately shod is with a radiograph. Our veterinarians happily work with area farriers to make sure that your horse’s feet are in the best shape possible.